With a cool enough pair of shades everything becomes obvious. What was once a confusing mess is now a cool swirl of colors. What was previously lost in all the lies and deceit becomes clear. You can see it all as long as you don't give up on your shades. Happy Easter. Pastel Colors put me in a cheerful spring mood, but the colors took me more tries than I would like to admit. The evil robot eye obscures the good heart of the bird that bares it. Not that that part is in the picture. Just looks like a rather grim fellow. Having escaped into the wilds the chicken was truly free. But the freedom was soon interrupted. To interfere with the chicken in broad daylight was really too much. These woodland critters were just far too bold. The line-work is a bit shaky but it's time to get back on the chicken making. 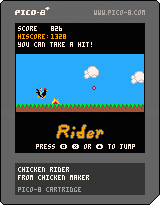 Available now we have Chicken Rider, another Pico-8 game. This is a pretty standard endless runner, but check it out if you have a few minutes. The real goal was using this sprite from a couple years ago.